long line - Lake Houston Fishing! Winter is probably the toughest time for conventional long-liners due to the crappie being lethargic and less apt to chase a bait. The key here is to slow down and vary size and color, as there will often be particular baits that will garner more aggressive strikes than others. Starting with small, 1/32-ounce heads and small profile baits are generally best. Spring long-lining finds anglers in the shallowest waters of the year. Although long-lining isn’t feasible shallower than 2 feet, 4- to 8-foot deep water can be very productive. “As long as there’s enough light penetration, the crappie will spawn. That’s why fish spawn deeper in clear lakes than stained or muddy lakes,” Bunting said. Mid-sized, 1/16 to 1/8-ounce heads and bright colors are good choices. Summer plays right into the long-liners hands, when larger profile baits at faster speeds consistently produce more crappie. The Buntings will use two, 1/8 or ¼-ounce jigheads per line with 2 ½-inch plastics and increase their speed during the hot months. 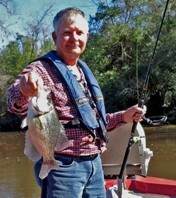 Fall is the best time to target schooling crappie that are aggressively feeding. scan areas looking for baitfish in likely areas. "I like to target balls of baitfish that are broken up,That lets us know crappie are actively feeding and disturbing those baitfish.